Chandra data indicates that a young star has likely destroyed and consumed an infant planet. If confirmed, this would be the first time that astronomers have witnessed such an event. The star, known as RW Aur A, is a few million years old and is located about 450 light years from Earth. Studying this may help astronomers gain insight into the processes affecting the early stages of planet development. 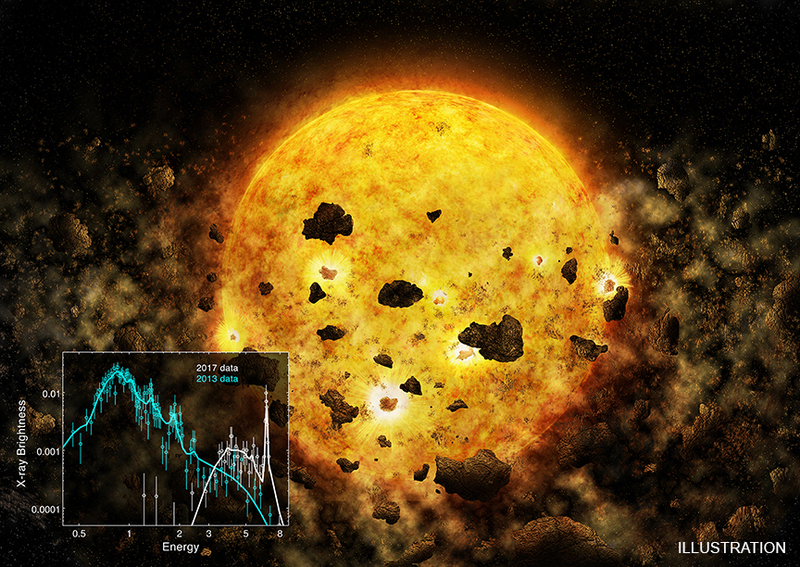 This artist's illustration depicts the destruction of a young planet or planets, which scientists may have witnessed for the first time using data from NASA's Chandra X-ray Observatory, as described in our latest press release. If this discovery is confirmed, it would give insight into the processes affecting the survival of infant planets. RW Aur A is a star about 450 light years from Earth, making it relatively nearby. Since the 1930s, astronomers have studied RW Aur A and been curious about why the optical light from this star changes over time. In recent years, scientists have observed that this variability has increased, with the star dimming even more and for longer periods of time. To investigate this mystery, a team of astronomers used Chandra to get information in the X-ray band of the electromagnetic spectrum. X-rays are generally emitted by more energetic and hotter phenomena than their optical light counterparts and can reveal information about different elements, including iron. The Chandra data suggest that the most recent dimming event from RW Aur A was caused by the collision of two "planetesimals" (that is, infant planetary bodies still in the process of formation), including at least one object large enough to be a planet. Because the X-rays come from the hot outer atmosphere of the star, changes in the X-ray spectrum — the intensity of X-rays measured at different energies — over these three observations were used to probe the density and composition of the absorbing material around the star. The team found that the dips in both optical and X-ray light are caused by dense gas obscuring the star's light. Also, a Chandra observation in 2017 showed strong emission from iron atoms, indicating that the disk contained at least 10 times more iron than in the 2013 observation during a bright period. 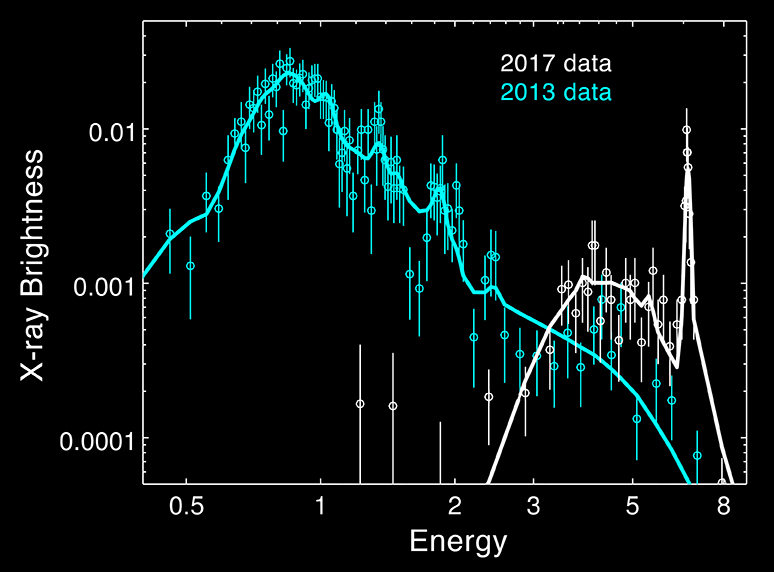 The Chandra spectra from the 2013 and 2017 observations are shown in an inset in the graphic. The sharp peak on the right side of the 2017 spectrum is a signature of a large amount of iron. The researchers propose the excess iron was created when the two planetesimals collided. If one or both planetary bodies are made partly of iron, their smash-up could release a large amount of iron into the star's disk and temporarily obscure its light as the material falls into the star. A paper describing these results led by Hans Moritz Guenther (MIT's Kavli Institute for Astrophysics) appears in the most recent issue of The Astrophysical Journal and is available online. The other authors on the paper are Til Birnstiel (Ludwig-Maximillians-University Munich), David Huenemoerder (MIT), David Principe (MIT), Christian Schneider (Hamburger Sternwarte), Scott Wolk (Harvard-Smithsonian Center for Astrophysics), Franky Dubois (Astrolab IRIS), Ludwig Logiie (Astrolab IRIS), Steve Rau (Astrolab IRIS), and Siegfried Vanaverbeke (Astrolab IRIS). NASA's Marshall Space Flight Center in Huntsville, Alabama, manages the Chandra program for NASA's Science Mission Directorate in Washington. The Smithsonian Astrophysical Observatory in Cambridge, Massachusetts, controls Chandra's science and flight operations. Coordinates (J2000) RA 05h 07m 49.5s | Dec 30° 24´ 05.1"
An illustration of a star consuming an infant planet. About 450 light years from Earth.